Before I get into today’s kids in the kitchen blog pot, I first want to welcome all new visitors to Kitchen Concoctions!!! For all you loyal Kitchen Concoctions friends, today I am being featured as part of Deborah’s blogger spotlight feature over on Taste and Tell. I was honored to be chosen to take part in this special feature on Deborah’s blog (her blog is one of my favorites). So if you want to learn even more about me and my food obsessions hop on over to Taste and Tell and read all about it! Now for today’s ‘Kids in the Kitchen’ recipe! I have featured a wide variety of recipes, activities and ideas as part of my ‘Kids in the Kitchen’ series this summer. Everything from Hand Tossed Ice Cream, to Foodie Field Trips, to Peach Smoothies. But today’s recipe screams childhood memories: bright pink lunch boxes, staying up late to read Nancy Drew books, side ponytails and slumber parties! I’ve said it before but I’ll say it again, Rice Krispie Treats are my childhood all wrapped up in on saaa-weeeeet square package! I really don’t know *ANYONE* who doesn’t love Rice Krispie Treats, let alone any kid! And because Rice Krispie Treats scream childhood memories and the carefree days of being a kid, I knew they had to be a part of the ‘Kids in the Kitchen’ series! 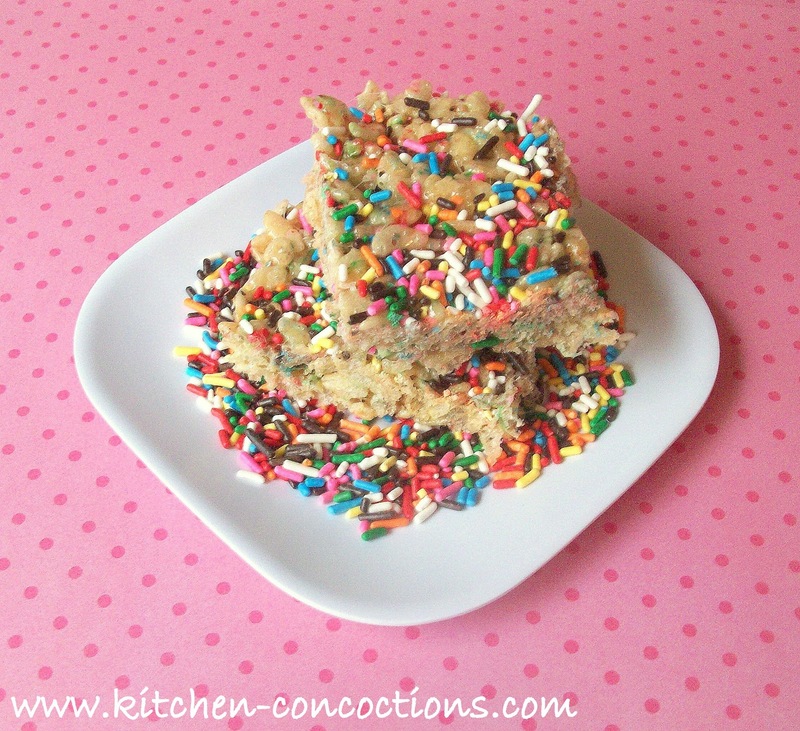 But not just any plain ‘ole Rice Krispie Treat, Cake Batter Rice Krispie Treats! Yes, my friends, I am finally jumping on the cake batter food fad! I actually have already ‘been there’ ‘done that’ since I made these awhile back, and meant to blog them then moved, got a new computer, moved again, then was going to save them for a ‘special occasion’ (what, I don’t know), and finally decided that now was as good as time as any. And hey, a kids cooking series sounds like a ‘special’ occasion to me. So before school starts in the next few weeks, whip up a batch of this classic childhood treat with a new foodie twist. Spray 9×13-inch baking dish with non-stick spray. Melt butter in a large saucepan over low heat. Stir in marshmallows, until they begin to melt, adding in cake mix one spoonful at a time until combined. Once completely melted, remove from heat and quickly stir in vanilla and cereal, until completely coated with marshmallow mixture. Sprinkle in ¼ cup sprinkles and mix. Press into prepared baking dish and top with remaining sprinkles as desired. Let treats cool before cutting. coming from taste and tell to say hello! 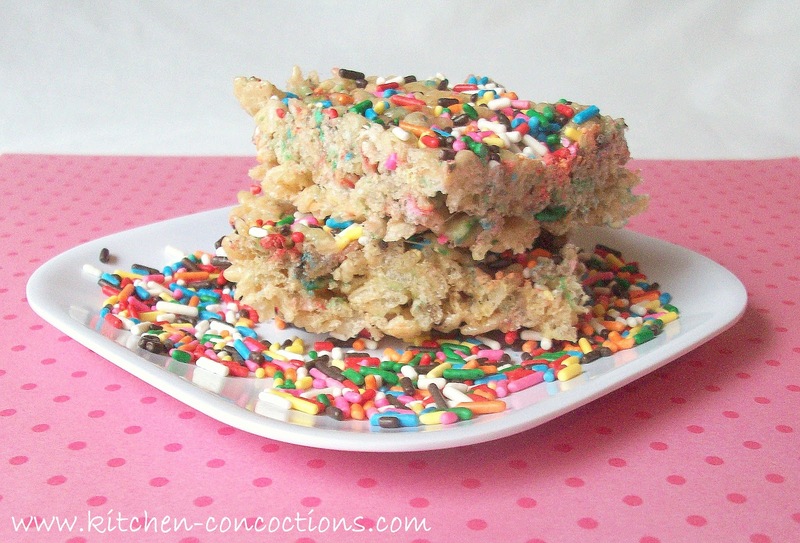 you've got a fabulous blog here, i love the look of those crispy treats! Hi Heather! Came across your blog via Taste & Tell's Blogger Spotlight. Looks like we're both in Austin too!!! Love reading local blogs especially!